On Thursday evening June 14th, Wild Tomorrow Fund welcomed guests to a sun-filled Tribeca penthouse for a fundraising event in partnership with world-renowned fine art photographer David Yarrow. David Yarrow (left), James Willis, Louis Buckworth and Aviv Siso (right) team up to help Wild Tomorrow Fund (John Steward, Axel Hunnicutt and Wendy Hapgood - middle) to save wildlife and wild places in southern Africa. The spring evening event was organized and co-hosted by three conservation-minded friends, Louis Buckworth, James Willis and Aviv Siso. Louis Buckworth, a successful New York real-estate broker for Zeckendorf Development's 520 Park Avenue, returned from safari in South Africa last year forever changed and committed to helping protect the wildlife and landscapes he'd fallen in love with. Louis called his friends James Willis, a hospitality figure, and Aviv Siso a successful real estate developer. Together this unique team collaboration culminated in the David Yarrow partnership event to raise awareness and funds for Wild Tomorrow Fund's critical conservation programs. "Wild Tomorrow Fund is active proof of the power of the individual to make a difference", explained Buckworth. "When people unite however around a common cause, the result is lasting change". Many new faces gathered to create that change for African wildlife, with 150 guests attending the evening event including actress Susan Sarandon. The Old Testament, Dinokeng South Africa 2017. 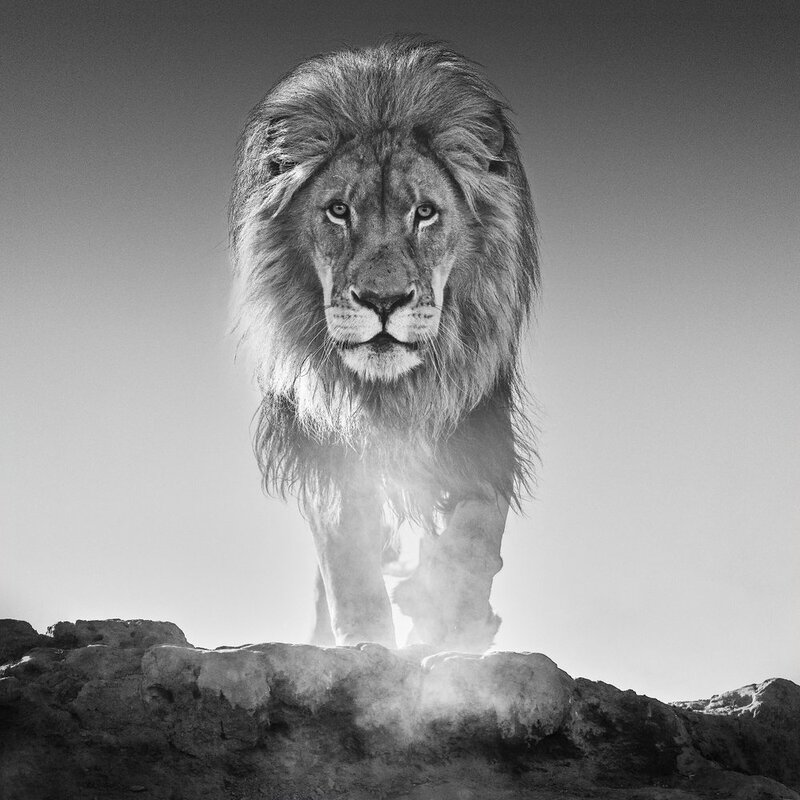 David Yarrow Limited Edition. The spacious private apartment in Tribeca was transformed into an African wildlife gallery, with David Yarrow's large-scale fine art photographs conveying the enormity, power and grace of African wildlife and the landscapes they inhabit. Every inch of the wall to the left of the bar was filled with the photograph of a male lion. Shot from below, the male lion towered above guests, his breath like steam in the dust of South Africa. The lion gazes with raw power into the viewer's eyes, powerfully close. It is this beauty and gravity that pulled viewers into the photograph, asking them how can we possibly consider a future where wild lions no longer exist? It is this wild beauty captured in Yarrow's wildlife photography that compels an emotional connection to wildlife conservation, urging those who look upon the images to fall to be moved to personally help in the battle to protect and conserve African wildlife. The focus of the evening event was fighting habitat loss. While the poaching of iconic species such as elephants and rhinos tends to be well publicized, habitat destruction and fragmentation is one of the most dangerous long-term threats to wildlife. “Once the poaching crisis for elephant ivory and rhino horn has been won - and make no mistake, we will win this war - we don’t want to wake up to find that there is no land left for elephants and rhinos” said Wild Tomorrow Fund founder and Executive Director, John Steward. "Saving habitat for wildlife is critically important. Join us in this mission before it its too late." Wild Tomorrow Fund is working urgently to save land in southern Africa, raising funds to create a wildlife corridor between two existing large-scale wildlife reserves in South Africa’s KwaZulu-Natal region (“Zululand”). Creating a wildlife corridor is an extremely targeted and cost effective tool to expand habitat for threatened species, the most important conservation safeguard against extinction. The Walk of Life, Amboseli Kenya 2018. David Yarrow Limited Edition. The land that is currently the focus of Wild Tomorrow Fund's fundraising efforts is over 1000 acres in size, and will form the critical link in a wildlife corridor project connecting to a UNESCO world heritage site, the iSimangaliso Wetland Park. By stitching fragmented landscapes back together, this will increase the carrying capacity of the previously disconnected reserves, opening space for population increase for elephants, rhinos and other threatened species. "We live in an era now when one of the biggest problems is not so much poaching of animals - it's just population growth and encroachment, and as the world population grows there is going to more habitat loss. Thats the monster coming over the hill," said Yarrow to the crowded room, "but by acquiring this land there will be no encroachment. With good people, and there are many in this room, things are getting better, and so you will be able to tell your grandchildren you have made a difference." Heaven Can Wait II. Amboseli, Kenya 2014. David Yarrow Limited Edition. A wall in the far lounge displayed a dark and atmospheric Yarrow piece. A giraffe kicks up dust as it runs out of the frame, a magical photographic capture under a dramatic Kenyan sky. This is the future Wild Tomorrow Fund is creating for wildlife - a giraffe running free in a landscape that seems to stretch forever. A video of a recent giraffe release at Wild Tomorrow Fund's Ukuwela Conservancy was screened on the evening, an uplifting scene showing six new giraffe jumping out of the transport truck and into an early morning sunset in Zululand, South Africa. It was a scene that demonstrated a sense of conservation optimism, and the possibility for a group of committed people to collectively create a different future for threatened wildlife. We can remain hopeful about conservation and the future for wildlife in southern Africa. By saving land, and restoring ecosystems by re-introducing wildlife and rehabilitating their habitat, we can ensure that the incredibly beautiful animals of southern Africa, captured so well by the lens of David Yarrow, can have a wild tomorrow. We encourage you all to join the Wild Tomorrow Fund family, and to be a personal part of this journey - of land conservation, rehabilitation and re-wilding. Together we can make a difference. A huge elephant-sized thank you to our event co-hosts and sponsors who made the night a success. Thanks to our sponsors, guests enjoyed chilled glasses of rosé from wine sponsor “Watts Up”, the namesake rosé wine created by Ben Watts, a fashion photographer and brother of Naomi Watts. Vodka cocktails were sponsored by Zirkova Vodka and dessert by vegan, plant-based restaurant byCHLOE. Click here for a gallery of event photos.